Vicarious Pleasure: The Art of Eating In | HuffPost . \r\nAuthor of COOKING UNDER PRESSURE (20th anniversary edition), PRESSURE PERFECT, THE PRESSURED COOK, GREAT VEGETARIAN COOKING UNDER PRESSURE, WHOLE GRAINS EVERY DAY, EVERY WAY (Beard Award-winner), WHOLE GRAINS FOR BUSY PEOPLE, THE NEW VEGAN COOKBOOK, SHORT-CUT VEGAN, LORNA SASS' COMPLETE VEGETARIAN KITCHEN. 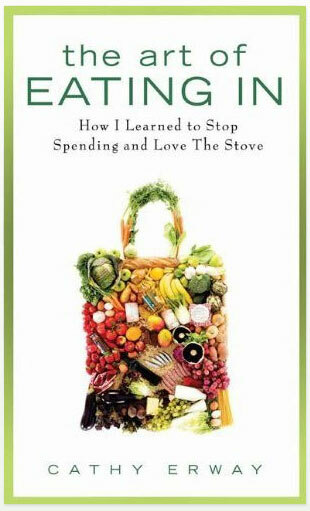 Since coming back from Maui, I've found the cold weather in NYC quite shocking and have stayed inside, warm and cozy, living vicariously through Cathy Erway's just-out book: The Art of Eating In: How I Learned to Stop Spending and Love the Stove. Actually, for someone who eats in, Erway goes out quite a lot. First off, she seems indefatigable and bikes everywhere, so I got some vicarious exercise too. But more to the point, I learned about a vigorous Brooklyn food scene that I knew nothing about before: private dining salons (why wasn't I invited? ), cook-offs, and even more exciting, a huge group of young foodies who take courses on butchering and enthusiastically swap recipes and restaurant recommendations. The title of the book doesn't really tell it all. Yes, the book is about the coming of age of a cook, but it's also about passion, curiosity, and the hard work and time it takes to get really good at doing something. It's also a book about friendships and conviviality based on a powerful common interest: Erway thinks nothing of meeting a friend for breakfast on her day off, just to try the square doughnuts at a new, highly touted doughnut shop. In addition to biking home at 3 in the morning when she's had a few too many, Erway is rather fearless about trying new things: joining freegans in their search for edible food in garbage pails outside of supermarkets, foraging for dinner in Prospect Park, making chili for 100 at a Cook-Off at the Brooklyn Botanic Garden's chili festival. She shares the details of these adventures with the detail of someone who digs deep and plays close attention. Yes, this is another one of those books built on a successful blog of the same title, with occasionally too much the feel of a personal diary -- Erway and her boyfriend break up at about the halfway point, when she loses her heart to blogging and he gets tired of eating in -- but this tome has a very appealing rush of passion and sincerity. What touched me most was that during her two years of eating in, Erway became more eco-conscious, recognizing how much less garbage and other waste she created by cooking at home instead of buying lots of take-out. In fact, she now blogs about environmental concerns for these very Green Pages, and is the inspiration for the HuffPost Green challenge to eat in for the week beginning February 22nd!